Large sample library collections (total 121 discs). The second incarnation of the Emulator, the Emulator II, was released in 1984. 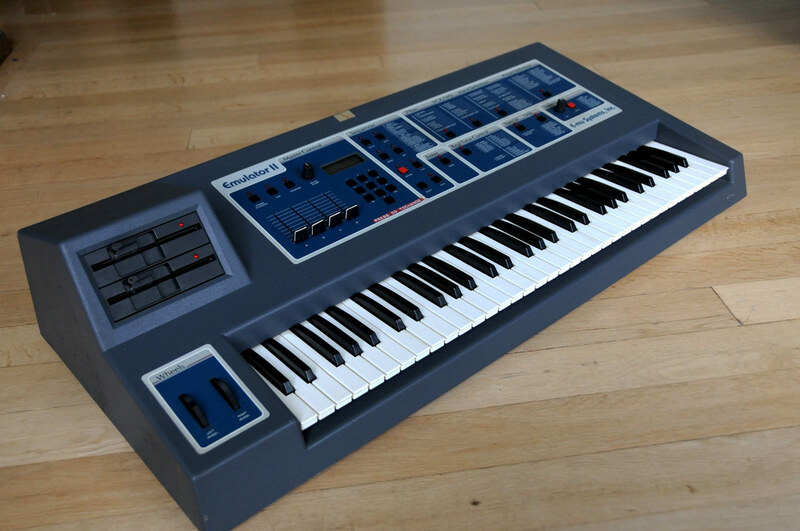 It boasted a 5-octave touch sensitive keyboard and featured basic MIDI functionality, a built-in sequencer, 8-voice polyphony, SMPTE for tape synchronisation and a small LCD display. In 1985, E-mu launched the Emulator II+, which had more sample memory and on later models, a dual disk drive. Like the Emulator I, it was an 8-bit sampler, however it had superior fidelity to the Emulator I due to the use of digital companding and a 27.7 kHz sample rate. It also allowed more flexibility in editing and shaping sounds as resonant analog filters were added and it had vastly better real time control. Several upgrades, including a second floppy drive, a 20 MB hard drive, and a 512K memory upgrade were available as well. Several highly respected OEM and 3rd party sample libraries were developed for the Emulator II including a multitude of superb orchestral sounds. 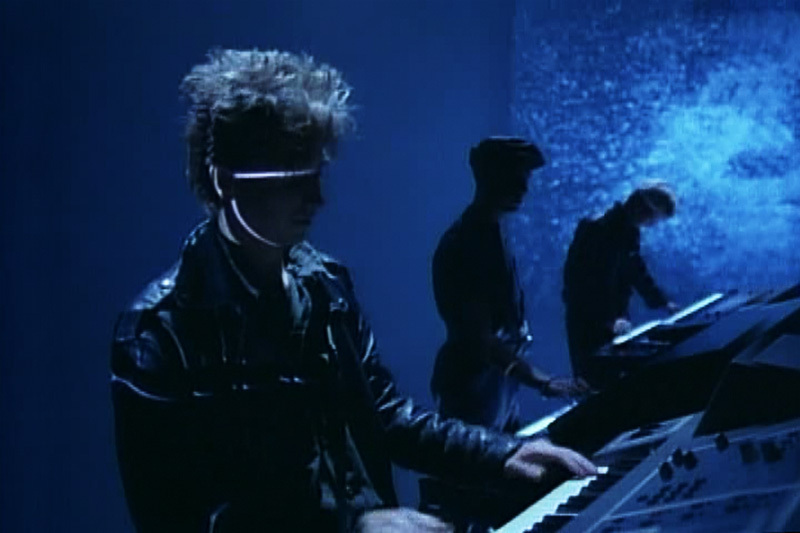 Famous samples include theShakuhachi flute used by Peter Gabriel in ‘Sledgehammer’ and on Enigma MCMXC a.D. Also, the male choir sound on New Order’s ‘Blue Monday’ and the Marcato Strings heard on so many ‘80s records including Pet Shop Boys’ ‘West End Girls’. In fact, every single sound on that track was made using an Emulator II (ref: Pet Shop Boys interview on ‘Synth Britannia’ BBC4, 16 Oct 2009). Since 2000, the Emulator II has risen in popularity due to the ‘80s pop culture resurgence and new artists wishing to revive the ‘80s Emulator-based sound. Websites selling the original floppies have emerged, such as (EmulatorII.com). DPCM mu-255 companding, it uses the divider-based variable sample-rate principle and analog output stages featuring SSM2045 24 dB/oct analog 4-pole low pass resonant filters. Emulator II: 27.7 kHz, 8 bits played at 14 bits, 512kb sample memory. Emulator II+: 27.7 kHz, 8 bits played at 14 bits, 1Mb sample memory. Emulator II HD: 27.7 kHz, 8 bits played at 14 bits, 1Mb sample memory, 20 Mb hard disk. “What can one say about the Emulator range? Used so much on DM recordings and on stage between 1983 and 1994, they were probably the most versatile of samplers from the 1980s. From the very first Emulator 1, I have used them all and been captivated by sampling technology ever since. I remember when we first inserted the huge floppy disc into the Emu 1 and listened to the ‘Motorbike Idling’ sound (which later became the mainstay rhythm behind the song ‘Stripped’), I was hooked. All over ‘Construction Time Again’ you can hear the Emulator with it’s grainy 8bit samples (later improved on other models of course). Think of the intro to ‘Everything Counts’ for example, and then most of the other sounds within the song as well, such as the main riff. Of course, I couldn’t list all the songs the Emulators have been used on suffice it to say that, compared to the vastly complicated Synclavier (which did sound amazing), the Emulator was almost always the sampler of choice. We continued to use them extensively on ‘Some Great Reward’, ‘Black Celebration’, ‘Music For the Masses’,‘Violator’ and ‘SOFAD’. As each model appeared, we acquired one (or several) right up to the E111 and the Emax for live use. They could prove troublesome on stage, the Emax being by far the only fairly reliable model for that purpose. My machines are all cosmetically in excellent condition and the E11 has now been repaired, with new power supply and LCD display to make it fully functional. Most appealing here is the collection of discs containing all kinds of interesting things. This Emulator 11 is the sampler on which the very first Recoil recording ‘1+2’ was entirely composed. I even used its internal sequencer for that EP, and you might just find that the ‘Recoil 4’ disc plays back the very sequence used in the original recording. Included with the E11 are 101 x 5.25” floppy discs, each containing unique library samples, original Recoil & DM patches plus much more. These are quite special although the disks are in a fairly fragile state due to age. We tested them and found 36 which would read. From these, almost 200 individual ‘unmapped’ samples (or voices in Emu speak) exist – ranging from short samples through to more obvious (bring a smile to your face) DM / Recoil classics. The most interesting discs are confirmed to be working. One is called ‘Christmas Island’ and contains samples used on the DM single, as demonstrated in Alan’s infamous Youtube clip from the ‘80s. We also successfully tested a disc called ‘Recoil 4’ with loops from early Recoil recordings, and one called ‘Shake The Disease’. 1 -10 : Emu Factory samples, including Grand Piano, Marcato Strings, Acoustic Guitar, Choir etc.